GET PACKING FOR THE TRIP OF YOUR LIFE!! In these pages, take a trip to the world you always wanted to live in—one filled with incredible adventure, bizarre beasts and unending mystery. Gathered here for your enjoyment is an all-new collection of stories from the pages of World Explorer magazine, perhaps the greatest journal of retro-weirdness, travel, archeology, cryptozoology, adventure and humor ever published—a magazine that would fascinate Indiana Jones and have him rolling with laughter! Get to know what World Explorers Club members have known for years: this world is a wild, wacky and wonderful place! This anthology includes many full-length articles from Volumes 2 and 3 of World Explorer, plus snippets of the magazine’s special features. You’ll pick up hysterical historical data on the exploits of the Club’s many chapters in the pictorial “WEX Remembers” segments. You’ll get to know and respect the skills of Professor Wexler (created by cartoonist Chas Berlin), who romps and stomps through time and space exploring, with little regard for personal peril, almost every oddity ever referenced. Cool adverts, mostly featuring fabulous retro art, abound. Authors include: David Hatcher Childress, Mark Amaru Pinkham, Dr. Marc Miller, Albert E. Sindlinger, Patrick Geryl, Jennifer Bolm and others. They write about these subjects and more: • The Hidden Labyrinth of Egypt • The Mystery of the Olmecs • Subterranean Tunnels • Giants Past and Present • The Enigma of Coral Castle • Mystery of the Crystal Obelisks • The Search for the Chupacabras • Thunderbirds over America • The Mono Grande of South America • Cargo Cults • The Lost Continent of Mu • Crystal Skulls • Peruvian UFOs • The Stones of Atlantis --tons more! Now only $18.95! 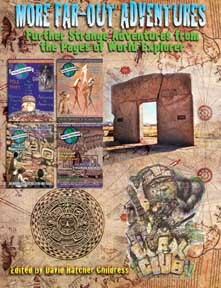 MORE FAR-OUT ADVENTURES: Further Strange Adventures from the Pages of World Explorer Magazine; Edited by David Hatcher Childress. 256 pages. 8x11 Paperback. Heavily Illustrated in Color and Black and White.